This event allows to dedicate the career of this great luchador been on rings for 40 years and also to better introduce him to the new generations. 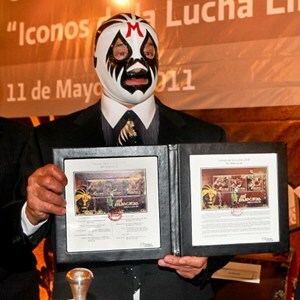 Mil Mascaras therefore is going to travel currently everywhere across Mexico thanks to the Mexican mail services!!! Also present at this occasion, El Hijo del Santo and the president of Mexican mail services have presented therefore these famous stamps that can be found found with different design under three forms. It 's about a nice homage made not only for a great luchador but still and also in a so representative cultural phenomenon and anchored in the Mexican tradition and popular culture.